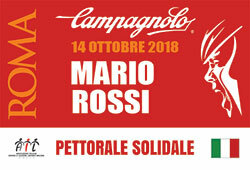 Take part in the Granfondo Campagnolo Roma and give yourself the thrill to ride for a good cause immersed in the age-old charm of the most beautiful city in the world. 125 km and 2025 m difference in altitude between the Colosseum, Roman Forum, Castel Sant'Angelo, St. Peter, the Castelli Romani, the hills of Rocca di Papa and Rocca Priora and the Terribili Murus and Rostrum. A non-competitive 60km ride open to all, including electrically assisted bicycles. No ranking, just willing to have fun. A special 12 km ride on the Appia Antica for the heroic cycling enthusiasts, reserved to pre-1987 bicycles and cyclists in vintage clothing. By supporting AIL, you receive the AIL RACING BIB, that allows you to live the emotions of the Granfondo Campagnolo Roma, riding for a good cause from the first row. The fund raised with your contribution will help AIL to support the HOME CARE SERVICES, that allow patients with a blood disease to be treated at their own home, surrounded by their loved ones. With your help you support the HOME CARE SERVICES, that allow patients with a blood disease to be treated at their own home. I accept the privacy information Click to read the privacy information. Watch the video of the last edition when over 6,000 cyclists have been given the unique thrill of riding for a good cause immersed in the age-old charm of the most beautiful city in the world.